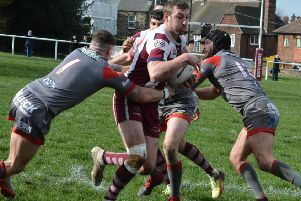 Batley have one win from their opening eight Championship fixtures and go into the game on the back of defeats to two of the leading contenders to secure promotion to Super League — Toronto Wolfpack and Toulouse Olympique — in the last fortnight. Coach Matt Diskin is set to make changes for the clash but admits his side will not be taking Lock Lane lightly. He said: “There will be changes. I will try to give game time to those boys who haven’t had much going into the Easter period. “Lock Lane are a quality outfit. They’ve got some players who have past experience with Batley and we are not going to take them lightly. “Easter is a big period for us. We’ve got to come out of that with some success given the poor start we’ve had. Niall Walker came off with a hamstring injury in last week’s defeat to Toulouse but is Batley’s only worry.